If your daughter showed some interest in engineering, it would be simple to nurture that interest through the numerous different robot kits available. And if your son was interested in maths, there are several websites that his teacher could likely recommend. But what if your child was interested in science? Do you buy a telescope? A microscope? Where should you even begin? Although science is fundamental to our understanding of how the world works, technologies that helps you engage your child in scientific concepts and scientific thinking are a little harder to come by. That’s what the team at Arludo are trying to change. Knowing full well that most students use mobile phones to perform every task, Aludo turns the mobile phone into a scientific instrument. Using any mobile device and over 20 different apps coupled with worksheets, anyone can begin exploring different scientific concepts. In Reservoir Crabs, students can bring crabs augmented reality crabs to life and watch them fight to understand what traits are important in contests. Playing through Spinder can help students understand how traits evolve and why certain traits are more likely to be paired with others. And playing Gerard Layzard can help students understand mimicry. Many of these games are made in collaboration with researchers all over the world. Along with helping students learn about fundamental scientific concepts, the games also provide researchers with an opportunity to explore theoretical questions that are difficult to explore in nature. For example, in the game Xenon Crow, players try and locate and eat different alien bugs to survive. Some bugs are camouflaged while others hide in plain sight and instead defend themselves through warning colouration. But there is a third group of bugs that are deimatic – they are camouflaged until a predator finds them after which they flash warning colouration. Dr Kate Umbers from Western Sydney University was interested in exploring what kind of benefit this flashy behaviour has, which is difficult to explore in nature. But through the game, Kate will now be able to look at how players respond to the flashy behaviour, whether there is any benefit, and how predators (students) learn. Along with continually creating new games that help teachers engage their students, Arludo is trying to improve class incursions. 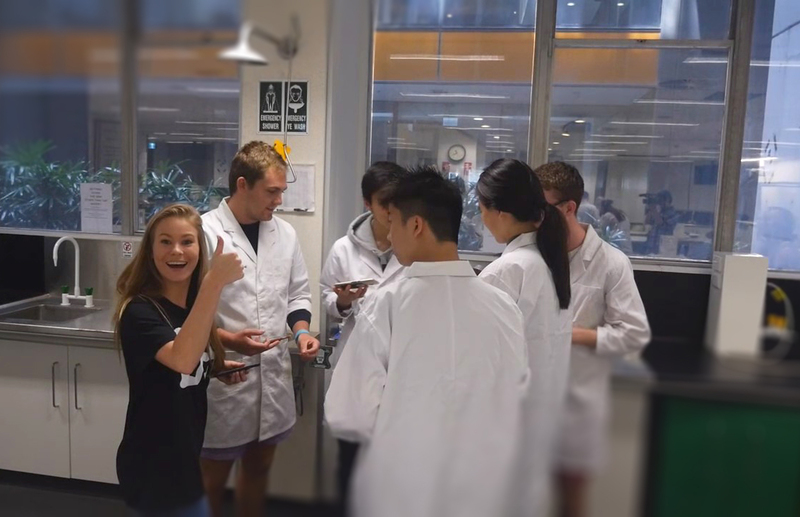 Partnering with students from UNSW Sydney and the Department of Education and Training in Victoria, Arludo is organising PhD students to enter classrooms and lead science experiments and class discussions. The goal is to help teachers bring in technology to engage students in science and demonstrate to students what a career in science is all about. Ask your teachers to sign up to Arludo for next year! Guest post by Dr. Michael Kasumovic, Associate Professor at UNSW Sydney and ARC Future Fellow, and Director of Arludo.